Faith, Hope, and Love details a personal journey with pitfalls and challenges that expands one’s consciousness from lower self to supreme self with liberal help and guidance from the universe at every step. 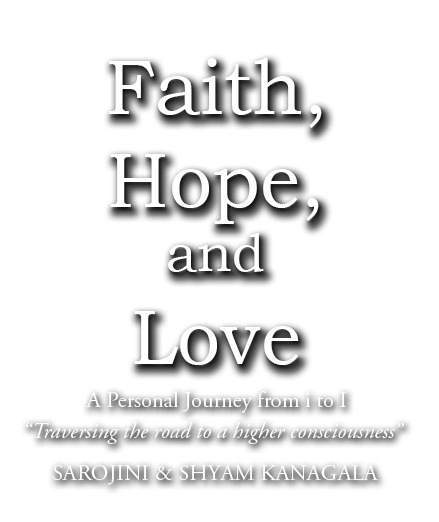 Sarojini & Shyam Kanagala share their journey as seekers of higher wisdom in this insightful book filled with spiritual treasures. Their story might pave the way for you to attain that radiant self you have long been looking for. In the pursuit of peace we often lose our peace. Once we feel complete from within we do not need to seek outer validation. Continue to give even if you do not receive back from the recipient. You will be renewed from the inner inexhaustible spring of love. Let the warmth of your heart be expressed from the depths of your being and the inner goodness be radiated all around. As we go through the journey of our lives - all relationships, thoughts, ideas, emotions, situations only help us to get to know our selves better. They are our teachers. Life is not for suffering. Life is meant for living, loving and sharing. Un-conditional love is a constant ever flowing, expanding, evolving stream where only oneness exists. As one dives deep within, the individual " i " drops its identity and merges with the universal consciousness, which neither has a beginning nor an end. Every simple act of kindness - a genuine smile, a gentle greeting, a meaningful interaction that we experience throughout the day is really the divine in disguise reaching out to us. Realization is not something that takes place in one stroke only. It can also be experienced as an ongoing, continuous, ever expanding state of being. With faith, hope, patience and love, we can traverse from where we are to where we want to be. All prayers, chants, hymns, paths of faith, service, meditation, remain as anchors to hold us through difficult times. When we forgive others that wronged or hurt us it does not mean that we condone their faulty thinking or hurtful actions. We make a vow that we will not get pulled down by those negative emotions any more. We are born to realize the Divine within each of us. Despite the differences we are one. We are spirit in essence. Once we move on from the feelings of mine and thine and include all it gets easier to see oneness around and slowly we will move from I to We to All. All of us are born with this limitless love. It has to be shared and given- until then it is of no value. I came to understand that life is not just meant for eating, sleeping and dying. It became clear that we all are born for a reason and we are here to share love. We are all made of love. This is our essence. That is reason why we feel happy when others are happy. We feel sad and depressed if other's go through severe pain and agony. Pain and happiness are contagious. We reach out to people in both cases. Having plans about life is just fine but attachment to them can be unhealthy. If I am constantly focused on what’s missing in my life I am overlooking my blessings and also depriving myself of simple joys and precious moments. We are surrounded by people but are estranged from hearts. We live nearer to a temple or church but are distanced from God. When we are aligned within ourselves we are aligned with the Universe. A master is the one who directs the student to the master within. Wisdom is - knowing the Truth. Detachment is - keeping out non-Truth. Wisdom + Detachment = Peace. Love is the key note of the music of life. Bringing one’s attention to the present moment helps to dissolve the restlessness of the mind. Life should be a journey from the transient joy of the iPod, iPad and iPhone to the permanent bliss of iAM. Love is the expression of oneness. We should love people as they are even if they are not as we would like them to be. One should be afraid not of others but of overlooking the still small voice of God within. All the spiritual practices help us to discover the limited nature of our mind and the limitless nature of our spirit. Love is the light that illuminates all relationships. Whenever anyone asks us where is God we usually point upward toward the deep blue sky. However once we recognize him seated in the inner altar of our heart we then experience the magic that unfolds. All of us carry the wisdom of Krishna, the light of Buddha, the love of Jesus, the peace of Muhammad. Life is an opportunity to manifest this grace and beauty that is resplendent within each one of us. There is no need to hurry, no reason to stress, no place to go, nowhere to be. Simply allow yourself to live and love in the here and now. Copyright © 2015. Sarojini & Shyam Kanagala | BalboaPress. All rights reserved.